We arrived early, and I am glad we did, so that I could take plenty of clear photos to share with you all. 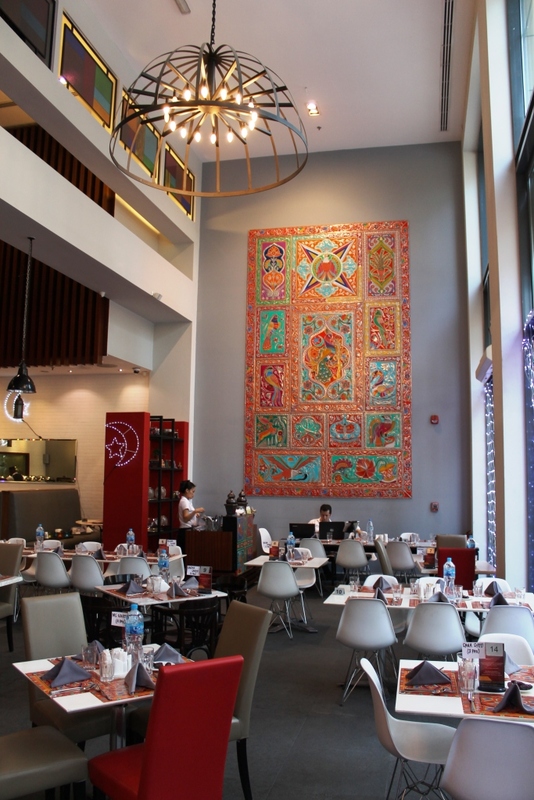 The interior decor and seating isn’t extravagant, and has a cafe like feel to it, however the Art pieces on the high ceiling walls were beautiful and reflected the choice of cuisine very well. The colourful place mats did the same. As I walked in, I noticed that almost every table had a name tag on it, and once confirming our booking, we were shown to our table with my name tag. As the time for Iftar set closer, only a handful of tables remained empty. The entire place was packed with guests, ready to devour the delights that awaited them. Since arriving early, I took the liberty of eyeing up my options for the evening. 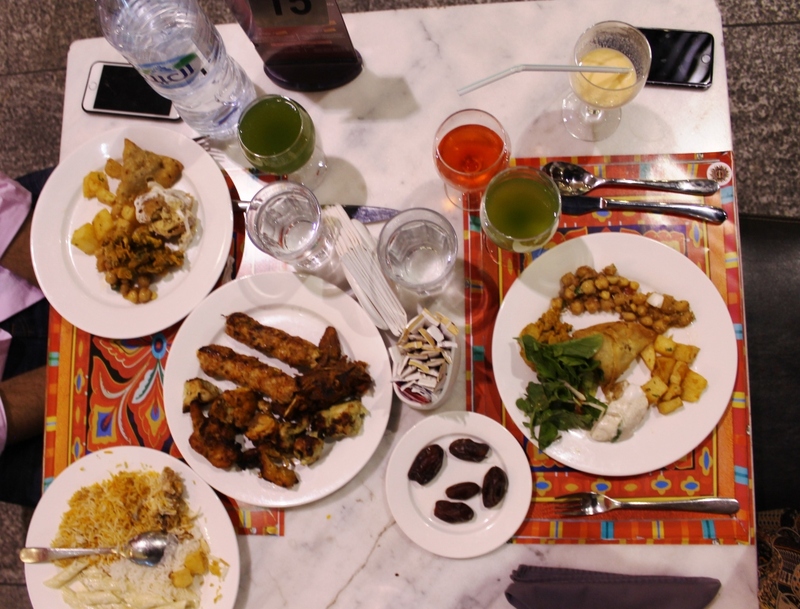 The long table of starters included Dates, Salads, Fruit Chaat, Aloo Chana, Haleem, Dahi Baray, Cholay, Pakoray and Samosas. 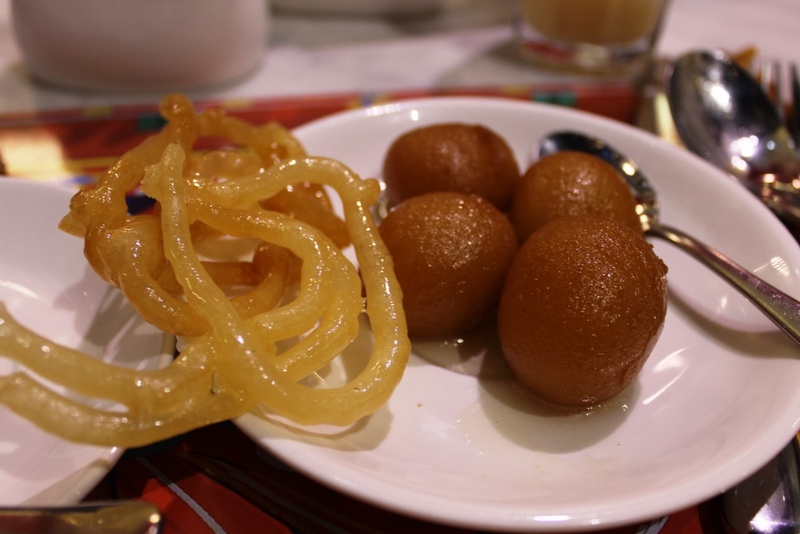 At the end of the table, I spied two desserts: Gulab Jamun and Jalebi. (I was in luck as both of these are my absolute favourites!) The drinks included Rooh Afza, Mint Lemonade and Mango Lassi. Tea was also brought in later on once Iftar had commenced. There were about 18 main dishes, by my husband’s count, and these included lots of freshly barbecued kebabs, beef and chicken pieces. 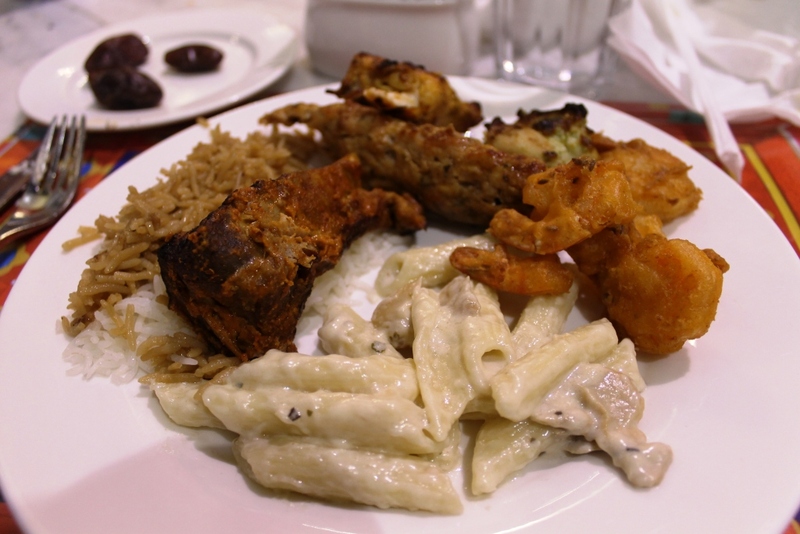 There was also Naan, Basmati Rice, Afghani Pulau, Daal, Fried Prawns and two varieties of Soups. I loved that behind the food, you could see the chefs live cooking the barbecue food for the guests, and it was apparent how popular the food is by the sheer amount of barbecue-ing going on! We filled our plates, awaiting the Maghrib Adhan (call to prayer at sunset) and the aroma around me had my stomach doing cartwheels. The entire restaurant was packed, and everyone was queing up next to the food. Even after the adhan sounded, there were still so many people filling up their plates, and I was glad that we already had our starters in front of us, as well as a plate of Barbecued items. 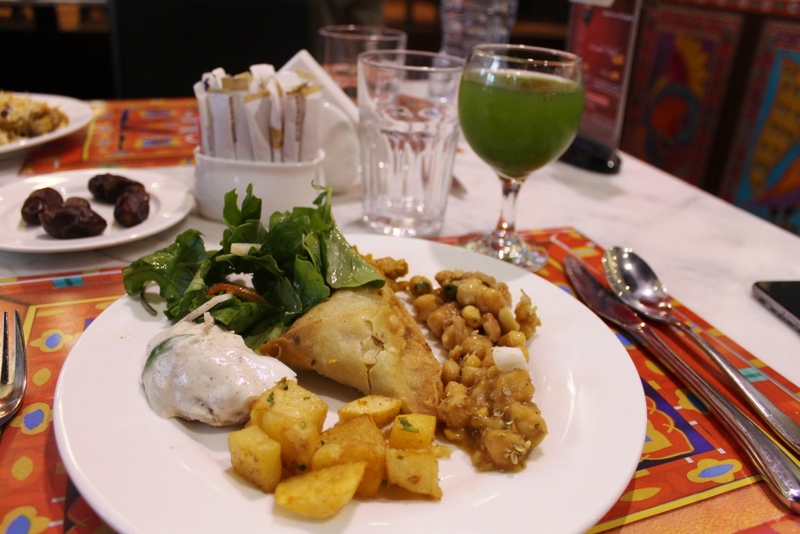 I do wish I could have tried everything, but for my starters I chose some Salad, two Chana dishes, Samosa, Pakorey, Spicy Potato and what Pakistanis are famous for: Dahi Baray. The Samosa and Dahi Baray was by far my favourite, both deliciously seasoned. The pakorey were spicy and crunchy, just the way they should be. Although I had planned to take my time, I ended up hurrying at the end, as I was too eager to try the barbecued food. 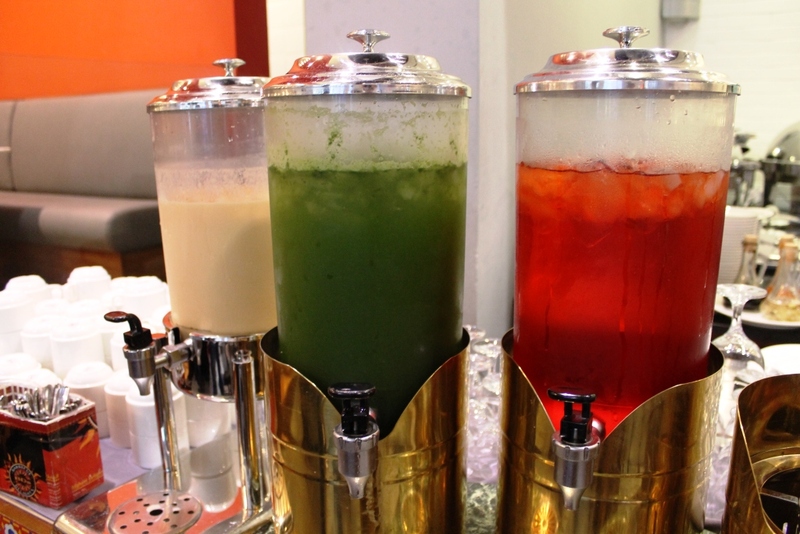 I did also try all three drinks, which were cold and refreshing. Though I am normally a big fan of Lassi, the sweet pink rooh afza was my personal favourite, whilst the Mint Lemonade was my husband’s pick. Let me tell you, this restaurant is not named Barbecue Delights for nothing. 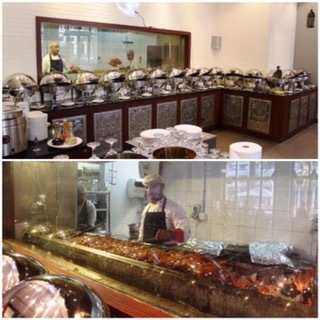 The barbecued dishes are truly scrumptious, and you will surely be licking your fingers by the end of it. My favourite was the Malai Boti, which you simply have to try. It is so tender and not at all spicy for a sweet tooth like me. My husband much preferred the spicy kebabs as well as the Chaap dishes. The Afghani pulau and biryani complimented the barbecue well and I absolutely loved the crunchy fried prawns. Baby Z devoured the Pulau and Pasta (weird combination, but hey whatever works for him!) , both of which were toddler friendly in terms of taste. The pasta was creamy and filling, so I had to make sure not to eat too much of it, otherwise I would have had no space for dessert! As you can probably tell, this is the part I was most looking forward to. After finishing my mains, I proceeded to fill a tiny plate with as many Gulab Jamuns the spoon could hold. Unfortunately, that was only four. I paired it with another favourite, Jalebi, and smugly glided back to my chair. Without sounding overly enthusiastic (though desserts do that to me), I could find no fault in either. The Jalebi was crispy and mouth watering. The Gulab Jamun was the best I have tasted in a very long time; perfectly round and golden brown, evenly saturated in a smooth sugar syrup and an absolute delight! 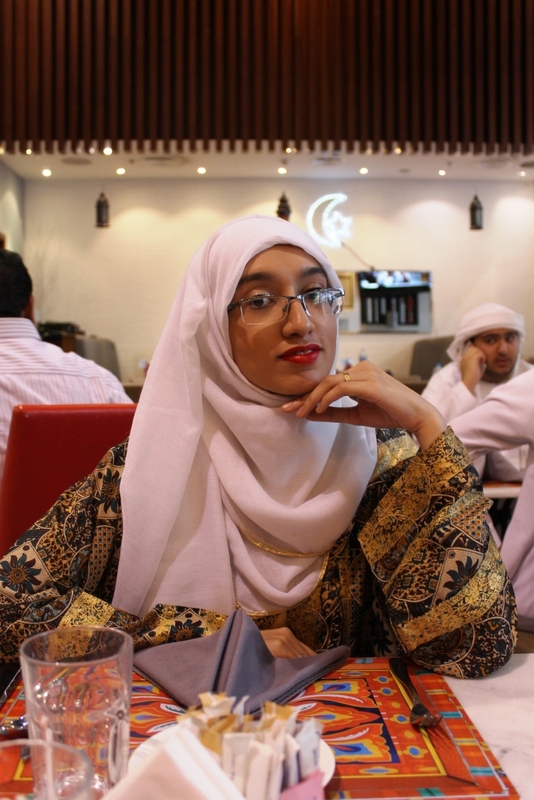 Overall, the Iftar was very good. 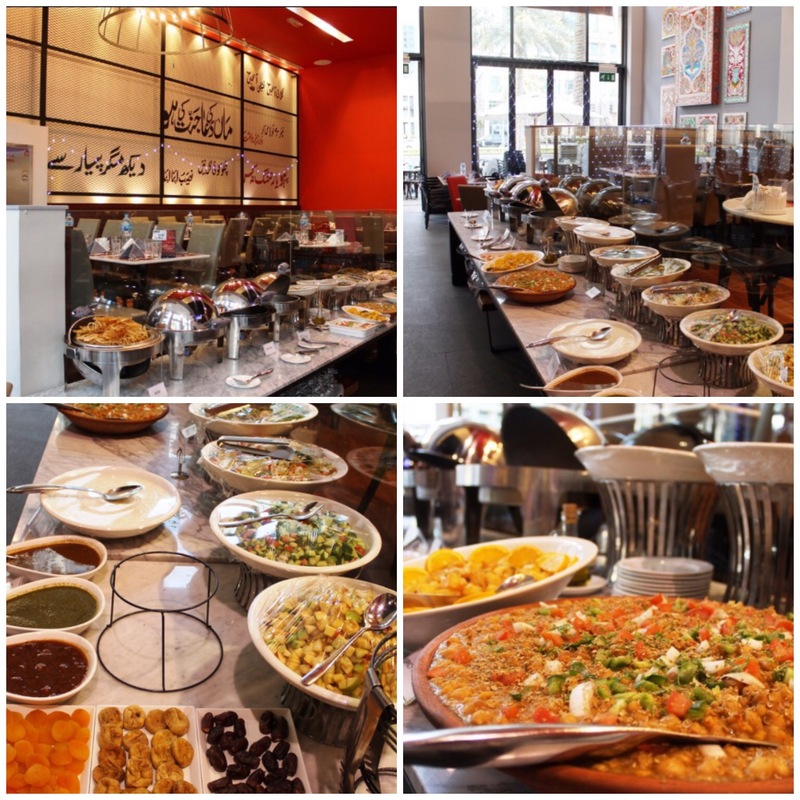 The venue and ambiance was rather too busy and chaotic, especially at the time of breaking the fast, but if you don’t mind lively places and a casual meal, then you should definitely try this place out. It is by no means fine dining, and it does not promise to be, but it is without a doubt very good value for money. 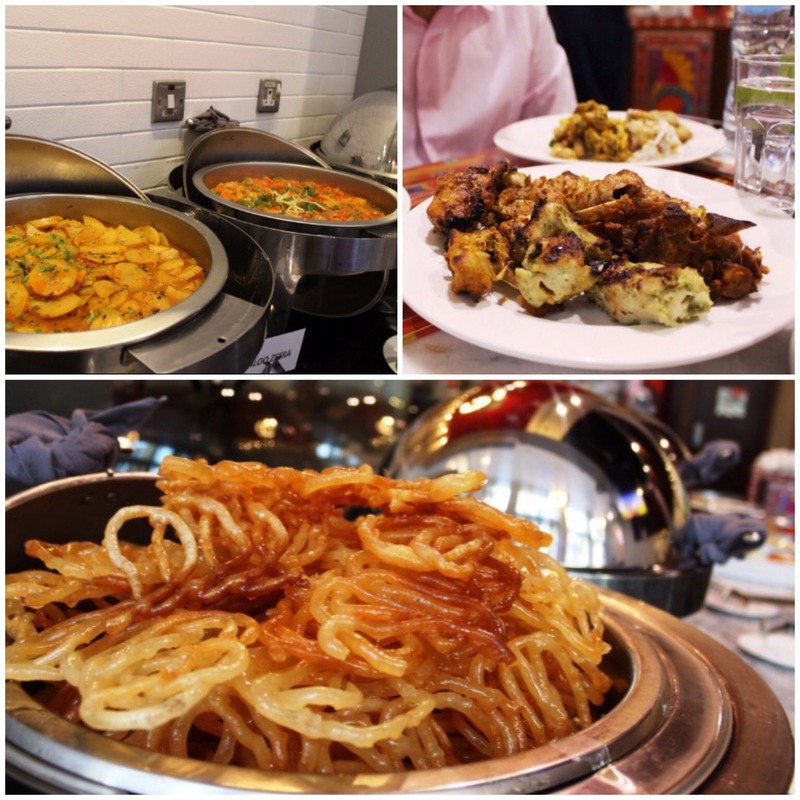 I can not praise the food enough, especially the barbecued food and desserts, and if you love your Pakistani, Afghani and North Indian cuisine, then this is the place you should be at for Iftar. I for one, know I will be back next year. 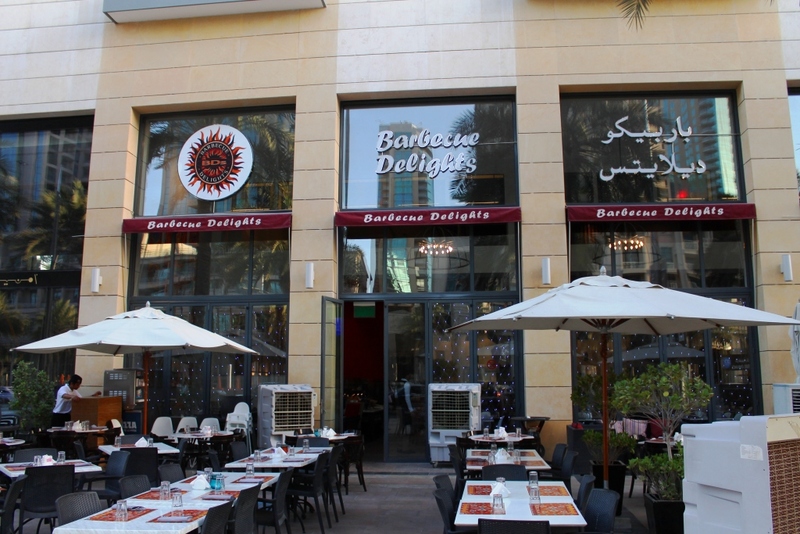 For more information about Barbecue Delights on what they have to offer, head on over to their website: www.barbecuedelights.com. or follow them for updates on Twitter. Facebook and Instagram. The food from starters to main to desserts looks mouth watering.